Webstet Bank President and CEO John R. Ciulla (left) and Gov. Ned Lamont talk with Capitol reporters. Gov. 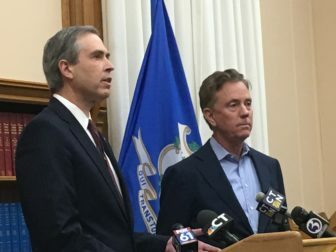 Ned Lamont and the president of Webster Bank announced a new partnership Tuesday to provide interest-free loans to essential federal workers who are unable to receive unemployment assistance during the government shutdown, now entering its 25th day. The program, which is being supported by the Connecticut Bankers Association, calls for Webster — and potentially other banks — to provide the loans. The state would guarantee the lending in event some recipients fail to repay. The governor estimated 1,200 to 1,500 federal workers in Connecticut could fall into this category, including air traffic controllers and certain Environmental Protection Agency staff. To qualify for unemployment, a federal employee has to be one of those furloughed as part of the ongoing shutdown, and not one of the more than 400,000 workers nationally asked to remain on the job without pay. Lamont said he doesn’t want federal workers, particularly those in crucial jobs tied to air traffic safety and environmental protection, to leave to find other work over what amounts to a technicality in unemployment rules. Full details and terms of the loans still are being developed, Ciulla said. But, he added, the loans will be provided interest-free. Ciulla also said that he anticipates other banks agree to participate in this relief program as it is developed. One key detail that still hasn’t been resolved is whether Lamont can act unilaterally to provide the loan guarantees — such as through an executive order — or whether it will require legislative action. The new governor, who was sworn in on Jan. 9, told one reporter he wasn’t sure of the process, but that he would reach out to legislative leaders on Wednesday and was confident the matter could be resolved. Legislative leaders from both parties quickly issued statements after Lamont’s announcement praising the governor’s efforts. “I know people are having trouble with simple cash flow – they need to buy food, to put gas in their car, to heat their home. And they’re running out of money,” said Sen. Cathy Osten, D-Sprague, co-chair of the Appropriations Committee. Osten and several other Democratic senators sponsored a bill Tuesday that would allow the Department of Labor to assist federal employees who are either furloughed or forced to work without pay to be paid through the state’s unemployment compensation fund. The fund would then be reimbursed by the employee once the federal government shutdown ends and federal employees are paid their back wages.